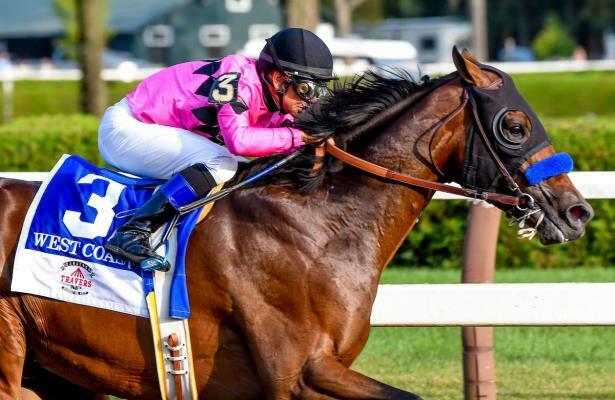 Reigning Champion Three-Year-Old Male West Coast, a dominant winner of both the Travers Stakes (G1) and Pennsylvania Derby (G1), will join the Lane’s End Farm stallion roster in 2019, it was announced Wednesday. Now 4, West Coast went on to open this season with one of the best races of his career when second to rival Gun Runner in the Pegasus World Cup (G1), the richest race in North America. He ran a career-best 117 Beyer Speed Figure and -4 1/4 Thorograph number that day. West Coast then shipped to Dubai, where he finished a strong second in the Dubai World Cup (G1). After a break, West Coast returned to the races last Saturday with a game effort to finish second to future Lane’s End Stallion Accelerate in the Awesome Again Stakes (G1). Bound for the Breeders’ Cup Classic, and a rematch with Accelerate, West Coast now boasts a career record of 12-6-5-1 with $5,743,800 in earnings. “I shipped him four times, west to east and then to Dubai, and he ran a huge race every time.” said trainer Bob Baffert. “He’s been first or second in all but one start, never off the board, and won at five different tracks. All the while taking on, and beating some of the best horses in the world. The good ones like him, they’re just different." The $425,000 Keeneland September purchase by longtime advisor Ben Glass, is out of the champion juvenile filly, Caressing.